Chicago (Ill.) - Documenting the payment of $200 to W. E. B. 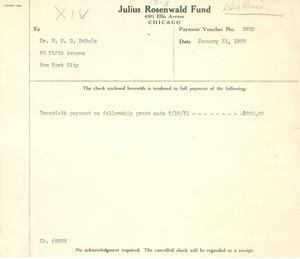 Du Bois, constituting the twentieth installment of his fellowship grant. 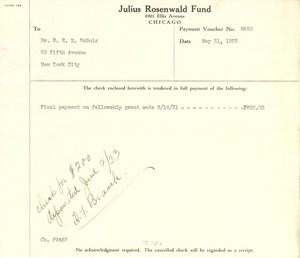 Chicago (Ill.) - Accompanying the Fund's check for $235.77 in reimbursement for expenses incurred from Du Bois's attendance at the May 28 dinner and seminar (drafted on verso of mums312-b122-i045, and submitted in mums312-b122-i042). Chicago (Ill.) - Documenting the payment of $200 to W. E. B. 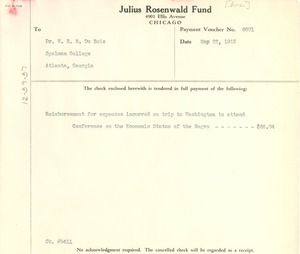 Du Bois, constituting the final installment of his fellowship grant. Chicago (Ill.) - Documenting the payment of $200 to W. E. B. 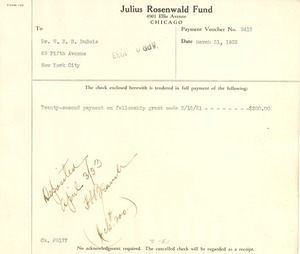 Du Bois, constituting the twenty-second installment of his fellowship grant. Chicago (Ill.) - Documenting the payment of $85.04 to W. E. B. 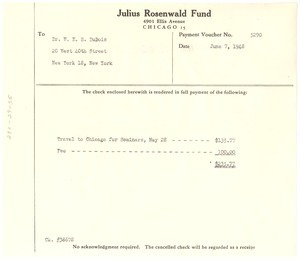 Du Bois in reimbursement of his Washington, D.C. conference travel expenses.